From the High North: How Kool is this?! 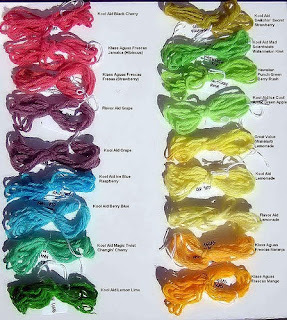 Some time back I read about Kool Aid dyeing of yarn. 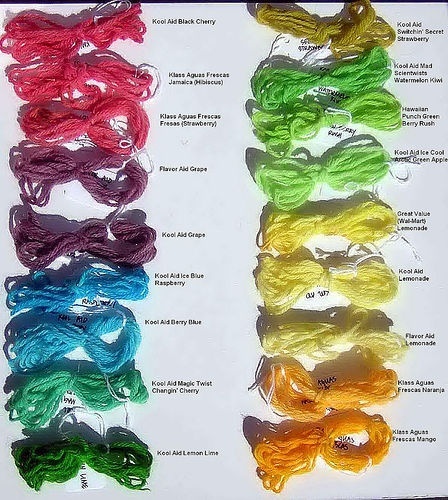 As I live in Norway, I didn't know about Kool Aid at all, and the idea that you could dye yarn with it was completely fascinating to me. Thank to the internet I had could investigate the topic and quickly found that I had to give it a go too. There was one major problem; where to get Kool Aid? Fortunateley I have some friends in the US and a young knitting friend of mine supplied me with a few packs of the miracle soft drink mix! Armed with white wool, Kool Aid and wonderful inspiration form blogs on the web I gave it a go last night! I took a 50g ball of yarn and wound it into a skein. I soaked it in warm water for about 30 minutes. I heated some water in a large pan. It was so hot it steamed, but it did not boil. I dropped the yarn in the pan and spread it out to be as loose as possible. I let is sit in the pan until the water was clear and the dye was absorbed by the yarn. I pored off the water and left the yarn to cool off a bit. I rinsed it in tepid water and hung it to dry. So much fun and so simple! I have a lot to learn when it comes to mixing colours - but isn't that part of the fun? I think it is! Kool Aid gives a permanent colour. For colour charts there are a few on the net, and I have found this (too bad I couldn't find out who to credit for it). Dying with Koolaid is so much fun! !